Beyond all the general projects I worked on for my design team, I also was part of a separate project, run solely by a group of interns. I was on the "movie theater" team. The summer intern project consisted of a small group of interns from different departments, like digital insights, account management, user experience, creative, marketing, etc. I was the only designer on my team, so I had a LOT of work to do in order for my team to show a rich and informative presentation to the company's CEO, and supporting team. We had to think up and develop a campaign to help launch the new facebook-esque feature of the new theater website, which beyond featuring show times and locations, allows users to have profiles, blog about movies, and create their own content, reviews, and everything in between. 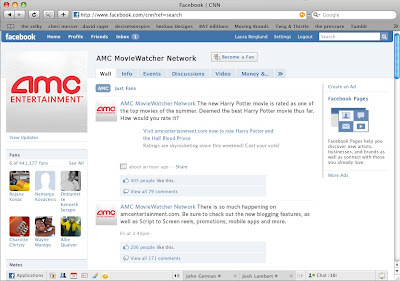 What sets the new amc website apart from its competitors is that it offers its users the tools necessary to make them feel like they have a real purpose on the site. 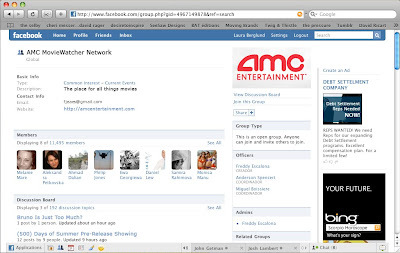 Blogging, personal profile pages, groups, space to connect with other movie fans and express opinions are all features that other movie theater sites lack. 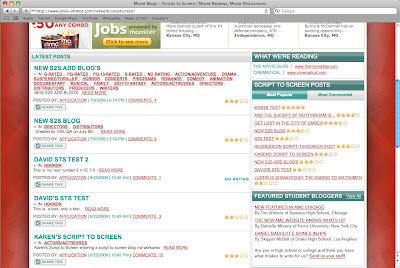 The site is a designated area for users to build their own content, and let everyone know which movies they approve of and which ones they don’t. 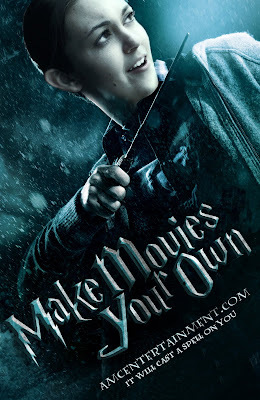 With that in mind, our campaign idea of “Make Movies Your Own” illuminates the potential of the new site by calling out the personal expression and customization aspect in numerous forms. 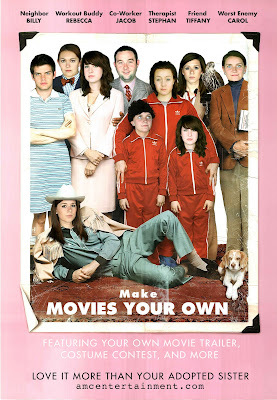 To kick off the campaign, we plan on developing a series of well-known movie posters, but instead of using big name actors, replace them with a bunch of nobodies (future users of the site!) 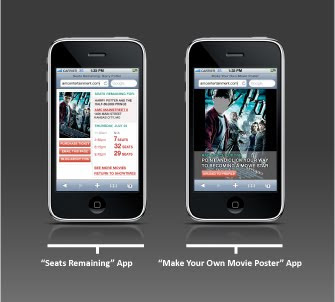 to show people that this website will allow them to customize their movie experiences. 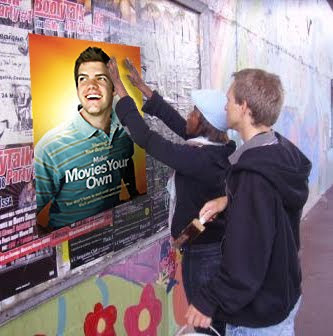 As the campaign progresses, and people begin to go to the site, users will be able to make their own version of our movie posters using their own faces to print out and put up around their city, guerrilla style. This could possible go viral, as more and more people catch on. The campaign also has many potential offshoots, describes on the following slides. 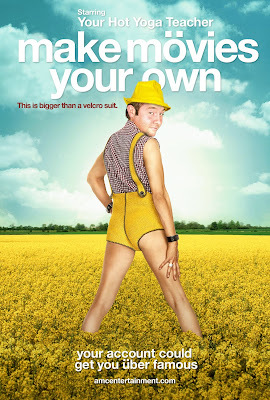 “Make Movies Your Own” simply put is a way to let our audiences know that this website is different. 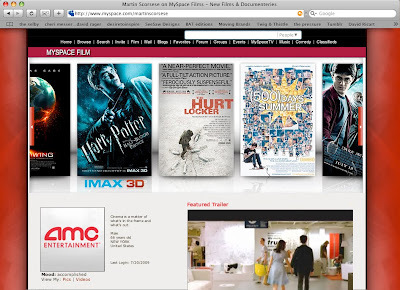 It has everything you would ever want on a theater website, but what really makes it stand out is its customizable features, that allows users to make their movie watching experience their own. 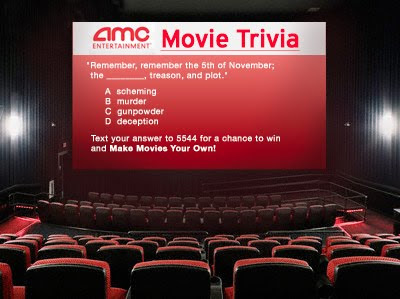 The new amc website is different from all of its competition because it offers audiences the whole movie watching experience… it’s the place to go for all things movies. To illuminate this idea, our campaign “All Things Movies” will show potential users what this website has to offer, but in the most unexpected places. For instance, a sign in a grocery store will say something like, “This grocery store is for all things food, just like (url) is for all things movies”. Or in a ball pit inside a Chuck E. Cheeses: “This ball pit is for all things germs just like (url) is for all things movies”. The idea behind this campaign is for people to be constantly surprised by these ads in unusual places, wherever they go throughout their day. This will allow our audience to expand quickly. 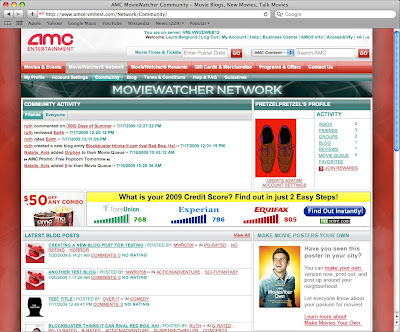 The theater's new site is about tapping into the users’ shared passion for movies. 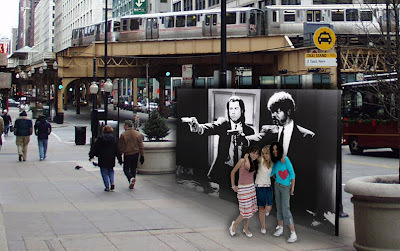 It is the place to go to find others like yourself, and connect through this shared love of movies. The campaign idea of “A Shared Passion for Movies” runs with the idea of passion, and all the meanings that the word passion may ignite. For instance, the signs that are often seen around Cities: “Single? Visit kcsingles.com”: we plan on channeling those signs, along with romantic calling cards, mysterious text messages, torn scraps of paper with “Looking for intense passion? Find it at (url). xoxo” scrawled on it in a loopy cursive. Mostly through offline means, this idea is definitely unconventional, and will get people talking. 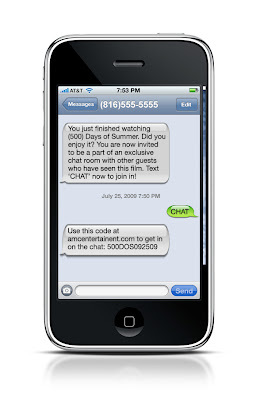 Throughout the course of a day, a series of mass text messages can be sent out, starting off vague: “Your search is over” (one txt), then later, “I’ve got some intense passion” (second txt)… the recipient is getting curious… “I’ll be your escape” (third txt)… the recipient is telling his friends… “Find me at (url)” (fourth text, the payoff). This could be expanded with viral video clips of hot movie-lovin’ singles advertising the site, just like the ones for match.com, etc. The “Instant Therapy” campaign idea is all about emphasizing how movies, blogging about movies, and finding similar minded friends all give users instant therapy. It’s their escape from reality, a place to relax, a place to express themselves. The idea will visualize itself through fake psychiatrist business cards, etc. To move towards something more unconventional/guerrilla style, couches and lounge chairs could be set up around the city with a fake psychiatrist sitting next to them, and willing participants could receive some ‘instant therapy’. They would then be told about the new site, or maybe just given the psychiatrist’s business card, which would also direct them to the site. 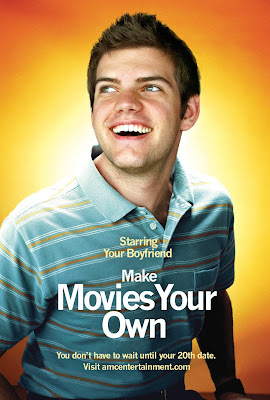 All these posters feature the faces of the interns on my team, but they could feature anyone. 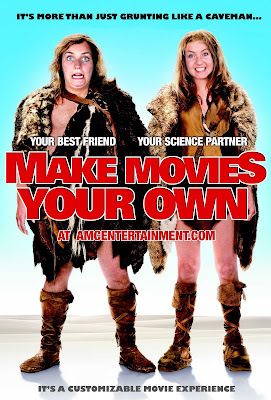 The point is to show our audience that on the new site, they are the star, and can make movies their own. including finding out how many seats are left for the show you want to go to, and an app that allows you to put your face into famous movie posters. Pods added to the existing site to enhance the campaign. 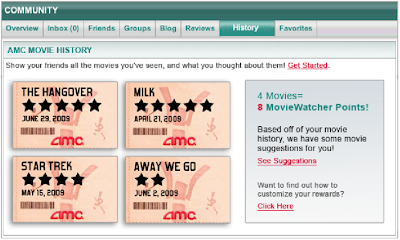 Loyalty Pod: a visualization of how many movies users have seen, and how they rated it right on their profile pages. 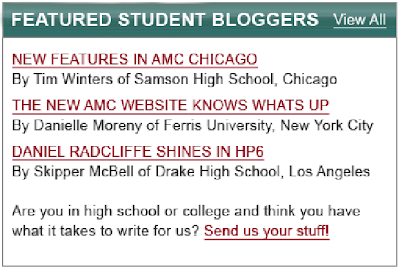 To get high schools and colleges involved in participation on the new site, we planned on inviting students from select schools to blog on the site, with a special section devoted to them. 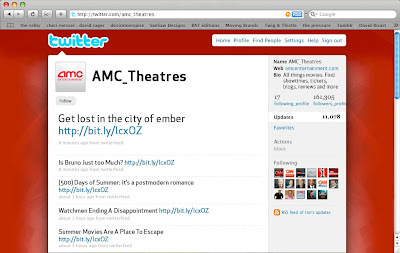 Contests for user-generated trailers to raise hype on the site, with a leader board on the main page to show the top rated trailers. 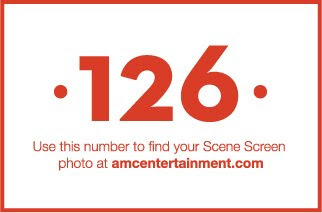 "scene screens" placed in big cities, with a photographer available to take your picture. You would then be handed a card with a number that would lead you to the new site to see your photo. 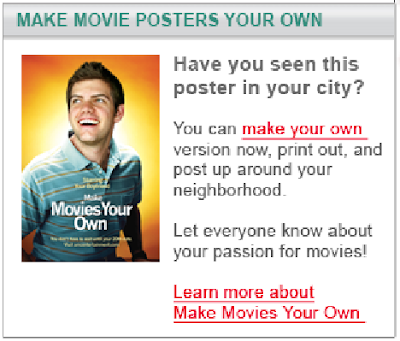 On the site, users could create their own version of the movie posters featuring themselves, which they would then be prompted to print out and hang in their city for guerrilla marketing. Answers handed out on the site; more traffic to site.